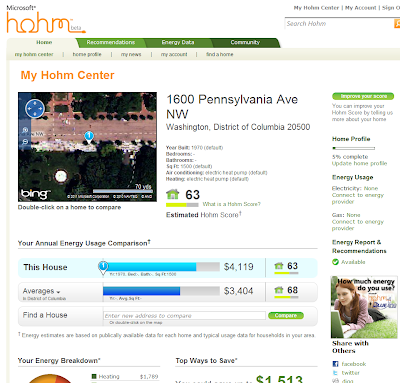 This shows the building's overall Hohm score, a measure of its efficiency from 0 to 100, 100 being the best. 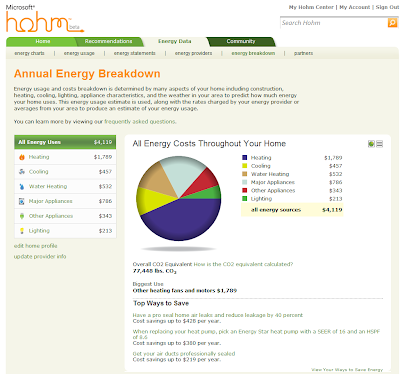 It also compares the annual cost of energy use of the building compared to the local area's average. Now the information shown here is very interesting. Without uploading any data collected from meters at the building, Hohm has estimated the breakdown of energy use. Not only is the overall consumption broken down by appliance type, but selecting an appliance type breaks it down further by individual appliances. I'd be really interested in how these estimated breakdowns change when the household aggregate energy data is uploaded. In addition, I'd like to see how these estimations differ from those produced by NIALMs. Hi Oliver, can I have the link to the dashboard pictures you showed? I searched but didn't find them. It seems the service is discontinued by May 2012. Thanks, Diego.